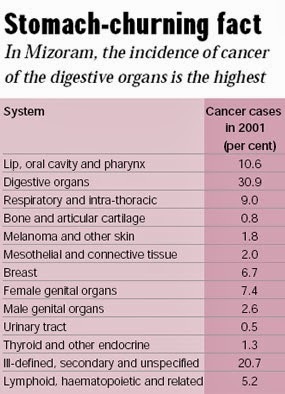 Aizawl, the capital of Mizoram, has the highest incidence of cancer in India. This is true for both men and women. The Northeast as a whole is most susceptible to the disease, according to data from the national cancer registry’s consolidated report for 2009-11. According to the report, which is likely to be released by the Indian Council of Medical Research (ICMR) in the next few months, the Northeast takes the top three slots for the incidence of cancer among both men and women. The age adjusted rate — a statistical tool to compare incidence among different communities at particular ages — for all cancers among men is 273.4 per 100,000 population in Aizawl, followed by Meghalaya’s East Khasi Hills district (216), the rest of Mizoram state (189.5), and Kamrup Urban in Assam (185.7). For women, Aizawl reported the highest incidence at 227.8 cases per 100,000 population, followed by Kamrup Urban (156.3), Mizoram state (153.7), and Bangalore (137.2). Data from state population-based registries show that cancers of the lung, mouth, oesophagus, stomach and nasopharynx are the most common among men. Among women, cancers of the breast, cervix, uterus, oesophagus and lung are the most common. Sources said the data shows that the Northeast has the highest incidence of stomach cancer in both men and women, besides a very high rate of oral cancer. “High incidence of smoking, which has been found to be higher than the national average among both men and women, and habits like using angeethis that produce a lot of smoke in closed spaces are possible contributing factors,” Dr P K Jhulka, radiation oncologist and dean at AIIMS, who is also in charge of the Delhi cancer registry, said. “Consumption of other tobacco products is also very high. Eating habits like consumption of smoked and fermented meats could also have a role to play,” Dr Jhulka added. Among the metros, Delhi is on top of the list for men with 125.2 cases per 100,000 population; Bangalore tops for women (137.2). Delhi is tenth on the all-India men’s list; Bangalore fourth on the all-India women’s. Lung cancer is the most common cancer among men in Delhi, Mumbai, Bangalore and Chennai. Delhi, with 13.9 cases per 100,000 population, has reported the highest incidence of lung cancer in the country. In Bhopal and Ahmedabad Urban, mouth cancer is the most common. Prostrate, tongue and mouth cancers are the most common after lung cancer in Delhi and Mumbai; stomach cancer is the second most common among men in Bangalore. In Ahmedabad, tongue and lung cancer are the second and third most common respectively. Among women, breast cancer remains the most common everywhere except in Barshi, Maharashtra, where cancer of the cervix is most common, followed by cancers of the breast and oesophagus. In keeping with data from previous reports, for women, cancers of the cervix and ovary are the second and third most common. Delhi has, however, seen a recent spurt in gall bladder cancer, which has jumped to third place at 9.2 cases per 100,000 population, pushing ovarian cancers to fourth (8.2). Dr Jhulka added that AIIMS is currently in the process of obtaining clearances from its ethics body to start a molecular study in “representative” areas of the region to understand the reasons more fully. “The molecular study will help us understand the genetic mutations in patients diagnosed with gall bladder cancers. Certain genes are known to be associated with causes like smoking, and certain known chemicals. This will help us understand the cause,” Dr Jhulka said.